Belay On!! Rock wall climbing is quickly becoming a popular party activity in Erie, PA and Crazy Monkey Inc. has one of the largest and safest rock wall rentals. 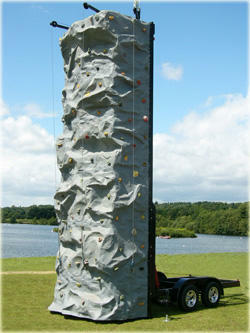 This party rental is great for large events, with room to set up this large rock wall. Our rock wall rental stands a towering 26ft tall and features 4 climbing lanes with the largest safety technology on the market. Kids love the fun and challenge of this awesome wall and parents appreciate the safety and care we put into each event. Our rock wall is not just for kids; it can hold up to 250 pounds with ease. Our wall features 4 different skill levels to challenge the more experienced climbers. Don’t worry about falling; our auto belay system lowers you down to the ground safely and slowly. Our unique rock wall rental is set up for climbers to challenge each other as they get more comfortable climbing. The first to the top can ring the buzzer! Crazy Monkey Inc. will deliver this huge rock wall right to your event in Erie, PA. Click here to contact us with questions and learn more about our great large event rentals.